Background: Lumboperitoneal (LP) shunts are effective in the treatment of intracranial hypertension but have traditionally been placed utilizing an open technique. This technique has been associated with migration of distal LP shunt catheters and can be especially difficult in the high proportion of obese patients, requiring a larger incision with greater associated morbidity and postoperative pain. A laparoscopic approach would also prevent an incision over the catheter path allowing a lower infection rate. We present our technique for the laparoscopic placement of LP shunts. 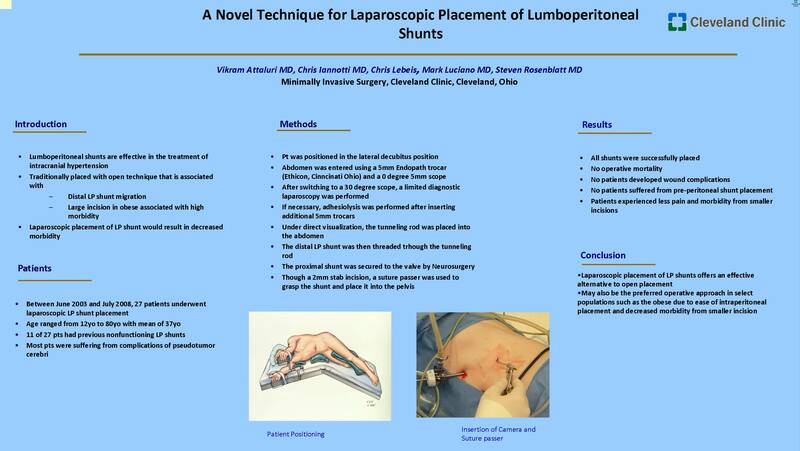 Methods: Between June 2003 and July 2008, 27 patients underwent laparoscopic LP shunt placement. Patients’ ages ranged from 12yo to 80yo with a mean of 37yo. 11 of 27 pts had previous LP shunts that were nonfunctioning. Most patients required the shunt due to complications of pseudotumor cerebri but one patient was treated for a recurrent spinal cyst. The follow-up period was current though August 2008. With the patient secured in the lateral decubitus position, the abdomen was entered using a 5mm Endopath trocar (Ethicon, Cincinnati Ohio) and a 0 degree 5 mm scope. After switching to a 30 degree scope, a limited diagnostic laparoscopy was performed. If adhesiolysis was necessary, then further 5 mm trocars were placed as needed. Under direct visualization, the tunneling rod was placed into the abdomen. Following which, the distal LP shunt was threaded through the tunneling rod into the peritoneum. The proximal shunt was then secured to the valve proximally by Neurosurgery. Through a 2mm stab incision, the suture passer was used to grasp the shunt and it was then placed into the pelvis. Results: All shunts were placed successfully. There was no associated operative morbidity or mortality. Similarly, there was no postoperative morbidity. Specifically, no patients developed wound complications or preperitoneal distal shunt placement, and the patients experienced decreased pain and morbidity associated with the smaller laparoscopic incisions. Conclusion: Laparoscopic placement of LP shunts offers a safe alternative to the open procedure. Our technique combines the proven efficacy of the open approach, with the proven advantages of laparoscopy, which include decreased postoperative pain, shorter hospital stay, quicker return to normal activity and improved cosmetic results. Indeed, it may also be the preferred technique in select patient populations such as the obese due to ease of intraperitoneal placement and decreased wound morbidity due to the smaller incisions.